Artisanal product deeply influenced by the Orkney Islands, this new Scapa Skiren Single Malt is a quite salty islander. 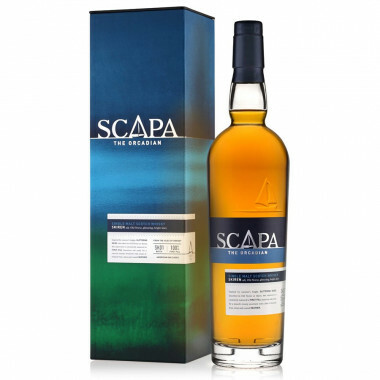 Artisanal product deeply influenced by the Orkney Islands, this new Scapa Skiren Single Malt is a quite salty islander. The complex character of this spirit reminds of the multiple aspects of the Orkneys, from changing weather to rugged landscape. Deeply fruity, Scapa Skiren evokes the sweetness and mellow of Irish whiskeys, wrapped up in the iodine character of the Islands and the medicinal and floral chocolate notes of Scotch whiskies. Entirely aged in first fill Bourbon barrels, this Single Malt has the shimmering colour of an autumn sun with a creamy and vanilla sweetness lifted by a touch of tropical fruits, lemon and coastal heather. The legendary Scapa distillery is located near the Scapa Flow, one of the biggest natural harbour in the world. One of the most historical bodies of waters of Scotland – Scapa Flow – is located in the Orkney Archipelago, off the Scottish North Coast. The peaceful waters of the Scapa Flow make it a natural, well-protected harbour for seamen and ships through ages. Hard to reach, closed from 1994 to 2000, this distillery is maybe the most traditional one in all Scotland, and was part of the “Magnificient 7”, the malts entering the composition of the famous Ballantine’s blend. Resulting from a unique craft production, Scapa whisky is produced from a Lomond wash still, which accounts for its velvety and delicate body. Only five men, together with the Master Distiller, are working at the distillery and make Scapa a rare, iconic Single Malt fascinating whisky lovers worldwide! Scapa has been part of the Pernod-Ricard group since 2005. Colour: bright, golden autumn yellow. Nose: complex, both fresh and vibrantwith delicate, floral aromas and summer fruits embraced by the iodine notes of the Orkneys. On the first hit, candied lemon open the discovery journey with nutmeg and pear flavours. The nose differenciates then malty and pastry notes of golden butter brioche, summer and floral notes of lilac, glycine and iris with a more herbaceous sage perfume. Palate: sweet, fruity and malty. Opens on a stunning, amazingly complex flavour palette, a blend of vanilla and chocolate notes joining perfumes of a luscious fruit basket: pear, melon, red fruits (red currant, strawberries), passion, mango and lemon. This fruity sweetness reminds of Irish tones. Finish: of exceptional length. The oaky and praline aromas coat the palate with fresh and mentholated notes lifted by a touch of acacia honey. A rich fruity finish, with appealing hues of coffee eclair and moka.